Located along the South Fork of the San Gabriel River in Georgetown, Blue Hole Park’s swimming area offers a great respite from the unrelenting heat of Texas. As the swimming zone is part of the San Gabriel River, the water here runs a bit warmer than other swimming holes in the area. It's broad swimming area, numerous picnic tables, clean bathroom facilities, minimal crowds and proximity to Georgetown's town square (six blocks to be exact) all make this swimming hole one of the top destinations in the area to beat the scorching heat of summer. The Deep Eddy Pool is the oldest and most historic swimming pool in Texas featuring a bathhouse built during the Depression era by the Works Progress Administration. The site, located on the Colorado River, was originally used as a swimming hole, because of the cold springs that rose from the river banks, became a resort, featuring a bathhouse, in the 1920s, and is now a popular swimming pool owned by the City of Austin. The shallow end, cool water, and massive cottonwood trees make this spot a family favorite! A small fee is required for admittance to the pool. Click here for more information. Three acres in size, Barton Springs Pool is fed from underground water and is a refreshing 68 degrees year-round (on average). 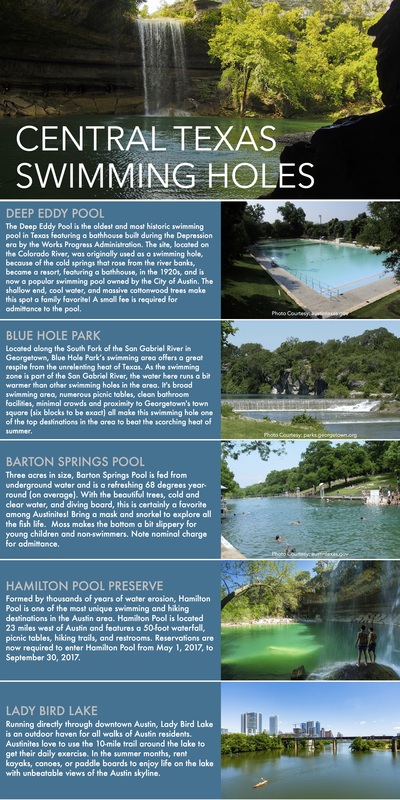 With the beautiful trees, cold and clear water, and diving board, this is certainly a favorite among Austinites! Bring a mask and snorkel to explore all the fish life. Moss makes the bottom a bit slippery for young children and non-swimmers. Note nominal charge for admittance. Formed by thousands of years of water erosion, Hamilton Pool is one of the most unique swimming and hiking destinations in the Austin area. Hamilton Pool is located 23 miles west of Austin and features a 50-foot waterfall, picnic tables, hiking trails, and restrooms. Reservations are now required to enter Hamilton Pool from May 1, 2017, to September 30, 2017 – click here to reserve your entrance to the pool. Running directly through downtown Austin, Lady Bird Lake is an outdoor haven for all walks of Austin residents. Austinites love to use the 10-mile trail around the lake to get their daily exercise. In the summer months, rent kayaks, canoes, or paddle boards to enjoy life on the lake with unbeatable views of the Austin skyline. Enjoy these water destinations for a fun, cool and refreshing summer in Central Texas! Do you have questions about any of Northwest Austin’s communities? Give me a call; I would be happy to answer any questions you may have!